Corollary to Jesus Christ’s prophecy to “rebuild” the temple in Jerusalem or “raise it up” after its destruction, the real and fundamental teachings on faith and worship He had begun imparting and eagerly wanted to instill in the lives of His disciples as the New and Living Way, as later on described and discussed in the New Testament. This Way, sadly however, has not been fully appreciated by many even today “in spirit and truth”. Although we think of Jesus’ prophecy as referring only to His soon-to-be-sacrificed body, the apostles would constantly talk of His body of believers or the spiritual temple He had intentionally established to become His palpable Kingdom while He began to reign in Heaven after His resurrection. In retrospect, the Kingdom, in its infancy stage, would showcase the simplicity, purity and joy – yes, the very perfection already — the Lord meant for His followers in future generations to emulate. Ironically, the plain well-documented picture of those first-century Kingdom-citizens somehow lost its appeal and relevance very early on when “wolves” moved among the flock and lorded over their assemblies, beginning in Asia and later on in Europe where many of the persecuted believers dispersed to become the unintended seeds of the much-divided, organized modern Christian religion. We note that, possibly, the so-called “church in the wilderness” is that part now rightfully called “the kingdoms of Christ” which hid or is hidden within the worldly kingdoms of Satan since that time to the present. It is not a specific sect or group (ever the mental set of modern humans at work seeking a name and a place) that moved out of society-at-large at that time and got lost from the historical records. Perhaps, the main reason we cannot find it (or we assume we cannot find it) is precisely because they did exist in Jerusalem at the birth of Christ’s Kingdom (Acts 2) and remained as pure and true followers of Christ, teaching and converting others to be like them. How can God’s spiritual seeds get lost when even plants, animals and humans increase in number no matter what His enemies do to the world He had created? Many today pride themselves of being the only saved believers or having the only true religion that is the sole authorized inheritor and depository of Christ’s teachings. This attitude seems to apply to many, if not all, denominations. But here is a simple quiz for everyone: The one you consider as your spiritual leader, did he or she enter by the gate designated by Christ? Can you name that person and the title held, whether that person lived in the first-century or is still living? Do you recognize that person as your spiritual guide, just like a sheep following its pastor, trembling at his presence or at the very title Pastor, Reverend or Eminence? Do you follow everything that that person teaches you to believe and do? Now, say that name. If the name is other than Jesus Christ, you are in grave danger. You have been following a thief and a deceitful shepherd — even if it were Peter or Paul or their supposed successor. Christ is the only true Gate, one Way, perfect Truth and eternal Life. And even if it were Jesus you follow, you still have to pass another test. For as Jesus had said, neither in Jerusalem nor in Samaria “shall they worship”. Neither in Rome nor in Manila. Neither in Paris nor in Lima. The systems and kingdoms of this world we talked about previously have ended up virtually dismembering the human body and devitalizing the human spirit through their own worldly programs. Our allegiance to the State arises from our desire to seek protection for our physical sustenance, political rights and the basic right to live a peaceful and prosperous life within a certain territory, something it cannot fulfill without God’s blessings. Our allegiance to Religion stems from our intrinsic need and dependence on a Provider Who will sustain us both physically and spiritually, something only God can fulfill and not any human organization. Finally, our allegiance to Business comes from our physical, psychological and financial need for fruitful employment and enjoyment, something next to impossible to attain without Heaven’s guidance. Overlaps exist, for the three are actually only one with three primary functions all directed toward supporting and preserving the single human being and the whole collection of all such beings. Whatever separation that exists today only arose from the sophistication and distinctions achieved through humans desiring to control one or more functions, whether out of goodwill or ill-will. Thieves will steal even from fellow-thieves; for there is no honor among thieves. For by definition, the worst thieves are those who rob God of His authority, glory and honor, not just those who rob from people or steal their very souls for their selfish goals. And their kingdoms are built exactly to capture people under their dark dominion. Where do you see in Scriptures that believers had to “organize” themselves and be recognized by the authorities as the “churches” or “kingdoms” of Christ? Where do we see the disciples ever building or putting up a physical “temple”, “tabernacle” or “cathedral” where they can be together to do what we do today in such structures? Where do we find in the teachings of the apostles that the “worship in spirit and truth” that Jesus taught was something the early believers did always as an assembly or as a group, that is, singing, praying, fellowshipping, studying or breaking bread (love-feasting)? We make the mistake of thinking that what we do today and what we see people doing today in formal assemblies or masses is exactly what the early believers did then. More than that, we believe that what we practice today is also exactly what Jesus meant for His believers to do. This issue is very crucial for it will determine if a person or a group claiming to be the called-out or kingdom of the Lord is, in fact, fulfilling the precept of “worship in spirit and truth”. First, registering an assembly, fellowship or religion as a formal church, denomination or sect is not only superfluous and unnecessary but demeaning and dangerous; for it puts the authority of the Lord under the kingdoms of this world. Can you see the irony and subversion in this deed? If Jesus now claims kingship over all worldly kingdoms, why should His spiritual kingdom be put under the rule of another lower kingdom? Denominationalism or religious sectarianism, as each clearly connotes, not only subverts God’s rule but divides His people’s allegiance between earthly kingdoms and His reign. Is this not obvious? Second, the early disciples (particularly the first-century believers) never put up permanent structures or temples to house themselves and their activities as servants of Jesus. They met in homes and Jewish temples whenever it was convenient for their purposes. The former was for their private assemblies (praying, study, edification, giving, fasting, healing, feasting, etc.) and the latter for their public obligations both as Jewish citizens and as Kingdom-citizens (teaching, evangelizing, helping the poor and praying in the temple). Look at the first case: Why would you need buildings if you have homes where you can do all those things just as well, if not better, than doing it in public? Do you put up a hall in order to teach your own children the word of God? No, the State did eventually put up schools in order to control the people’s minds by teaching them what the State needs, not what the Lord needs. Are you happy that you allow non-believers to teach your children what you should be teaching them as children of God? The early organized State and organized Religion saw the wisdom of putting the masses under a world-directed order (Old World Order, now becoming New) while limiting their abilities to be free from their direct and active control. Each organized Religion, then, is a mere copy of what was begun earlier on when the wolves scattered the flock and rounded them into sects and cults that have departed from the purity of Christ’s original teaching of “worship” or service to God “in spirit and truth”. Remember, that phrase was declared by Jesus AFTER telling the Samaritan woman that “neither in Jerusalem nor in Samaria” (where there were temples of worship) shall the “true worshipers worship the Father in spirit and truth”. (John 14:21-24) So, why should we set up a place or pattern of so-called worship that contradicts and directly contravenes that teaching? A hall, cathedral or temple is a place used for the old form of site-based worship Jesus already declared obsolete. A worship service, mass or liturgy is a pattern of worship which revives the ancient required offerings done in temples but dressed in modern form. These are not genuine worship “in spirit and truth”, obviously, for they merely mimic old, dying ways and not reflective of Christ’s New and Living Way. The pretentiousness of people within Organized Religion is the very pretentiousness of Organized Religion and the whole idea of it justifying itself in the face of Christ’s express words. What does “in spirit and truth” mean other than being REAL-TIME LIVING under the new reign of Jesus Christ Who is the same yesterday, today and tomorrow. Worship is living. Living is worship. If the Truth of Christ is in you, you are His temple and kingdom – offer your life, praise and sacrifices the way you would live your life as a free agent of His blessings and grace. Why should you wait to go to a place or perform certain ceremonies to serve or worship God? If your body is a temple, worship must begin and end there; beyond that is of human invention and not of Christ. Be free from such teachings. Christ died to set you fully free from such burdens and regulations of the old laws made to appear new by deceived teachers. Thirdly and finally, the formal worship we are so accustomed to today incorporates all the possible activities believers can and must do in the assembly place, whether in a small shack or a large auditorium. So much so that majority of members feel they are obligated to be there and not to miss the “assembly”, the “worship” or the “Lord’s Supper”; otherwise, they would fail to worship God properly. Members are obliged to fulfill this “worship hour” as a necessary duty of every believer, at least once or twice a week. Worship, in all of its various meanings and possibilities, has unfortunately come down to this rigid idea of duty, compulsion or obligation instead of the very expression of total freedom in Christ itself. Do you really think Christ would tell the Samaritan woman of a time when physical temples will no longer be given tacit divine recognition and still require, approve or even condone their use to fulfill His New and Living Way? We have to be so dull to think so – and even duller to do it still in spite of what He had said. Yes, we do not deny how much religion in its patent denominational structure has done to serve humanity’s needs for the past two millennia. Why should we then question its existence or its validity as a social and cultural mechanism that benefits families, communities, nations and even empires throughout history? We can say exactly the same thing about Judaism. Here is a much older paradigm that served as the foundation or model for many of our social, economic and political institutions. But why did Christ replace it? Yes, He did, after having given Himself up. And why did He absolutely subvert it in favor of something that we do not seem to fully understand and appreciate until now? Clearly, the fact is that we do not have a single, unified, coordinated and unifying paradigm that took the place of Judaism – the way Jesus would have planned and expected it to – and, instead, what we have is something that harks back to the chaos and confusion that characterized the divided kingdoms of Israel and Judah. Do we really think that Jesus reigns over a Kingdom that is scattered over so many denominations and religious systems – more than 30,000 as of the last count – all worldly kingdoms where He has many free, individual kingdoms who follow His bidding perfectly? His Kingdom is one unified and absolutely robust body which includes the spirits of angels and the souls of the faithful departed. When we said He rules over all the kingdoms of this world, we mean He has laid claim or ownership of all that humans claim to be theirs. But His One Holy Kingdom is made up of redeemed souls and spirits of humans who follow His word according to His pure, simple and perfect plan. (Heb. 12:22-24) It does not include the physical and virtual kingdoms or systems built by humans. For these are not living beings capable of worshipping God “in spirit and truth” but human structures and principles designed to enslave people to worldly ideas, practices and goals not consistent with the intents of the Spirit of Truth. 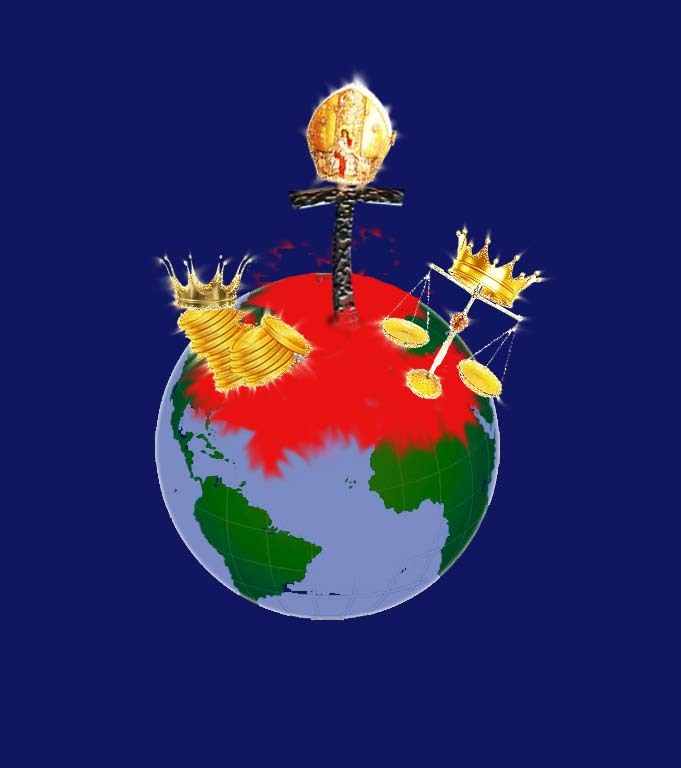 Of course, these earthly kingdoms portray themselves to be legitimate; for they are ruled by powers and principalities who have sat on the “earthly throne of Christ” – ruling men and women who make up their earthly fiefdoms. Until we realize that what we see today as falling short of Christ’s original intentions, we will continue to plod on smugly, believing everything is alright with the world and that God is pleased with what everyone else is doing in their own religious circles, saying: There is unity in diversity. All this is God’s way of allowing variety, individuality and freedom in serving Him. That may be true and admirable; but it falls way, way off the target set by the apostles for God’s household – having one spirit, one mind, one purpose, one hope and one love. Pray tell: Does the present World Religion, as a whole and as parts, even portray a third or half of those criteria? When did Christendom ever have “one mind” to boast of? Or when did your congregation or sect ever have “one spirit” and “one purpose” in disbursing the funds in the church treasury, not merely a decision by a majority through the show of hands or general secret-ballot? Are we saying we should expect perfect agreement and absolute unity within one sect and among all denominations? Why not, if we are to say we belong to Christ? But because this very idea is virtually impossible under this worldly organized-system, it proves that the system or structure has never been God’s idea at all from the beginning. Our general idea of unity is one fraught with so much compromise, bargaining and trading – in short, politics, thus, making the Lord’s work no different from any ordinary political party or business corporation. We would not be the Kingdom of Christ if we are not one with Him and in Him. Would we? So, are we? No, precisely because we are not one and we are not united, we are not then His Kingdom. Simple logic! But any person can be His kingdom united with Christ if that person perfectly follows His leading, not by worldly, denominational and partisan religious dictates but through simple “worship in spirit and truth” in accordance to His perfect will. Through the incomprehensible work and guidance of the Holy Spirit, the coordination and unifying of so many such submitted kingdoms results into a perfectly orchestrated work of Music made and played by the Lord in Heaven. But we will never know how this exactly works or how it looks because we have never allowed the Holy Spirit and the Lord Jesus to work their effectual power upon us. We reign today over our own human kingdoms and not with God over His spiritual kingdoms which we are or should be, in reality. Where do you worship? How do you worship? If your answers will allow anyone to track you predictably and accurately within a few meters and in real-time on a daily or weekly-basis through a GPS instrument, you might need to study the Lord’s words again and find out what He really means — and finally claim true freedom in Jesus Christ.